Built in 2000, this newly-refurnished townhome features 2 large bedrooms with baths ensuite on the second floor, complete with vaulted ceilings. One bedroom has a king bed, the other has a queen and a twin upper bunk as well as deck access. Downstairs is a quarter bath and a sleeper sofa for two. There is also a raised twin air mattress available for your use. Enjoy use of a full-service kitchen with dishwasher, disposal, coffee maker (and grinder), electric tea kettle, and microwave. There is seating for six at a gorgeous aspen dining room table, as well as three stools at an eat-in bar. This home comes with Satellite TV, hi-speed wireless internet access, washer/dryer, fenced front and side yards, 2 decks and a charcoal grill. In-floor radiant heat and a gas fireplace complete your mountain getaway. The house is only 3 houses away from the Mountain Express free bus stop and is 2 blocks from two grocery stores, coffee shops, the Nordic Center, and Elk Avenue (Crested Butte’s main street—where most of the restaurants are located). If you do bring a car, there are 2 off-street parking spaces in the driveway (great for bike storage, too!). With this spacious town home as your home base, we know you’ll come to love Crested Butte as much as we do. We are licensed with the Town of Crested Butte (license #001300) and remit all applicable taxes to local, county, and state authorities. Keywords: Cabin, House, Town Home, duplex, two bedroom, crested butte, in-town, spacious living area, fenced yard, near ski bus, internet access, kid friendly, pet friendly. We visited Crested Butte a few years ago during the wildflower season. We came back for the skiing, and then for the mountain-biking climbing, and now we are hooked. So is our dog. He enjoys the hiking and cross-country skiing. The front and side yards are fenced. Beautiful flower garden in the front yard. There is a back deck and an upper-level balcony. 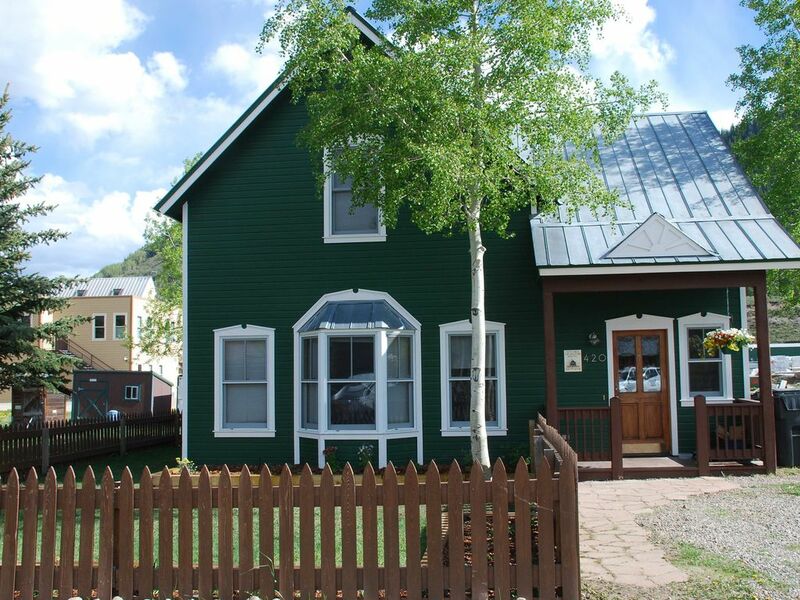 We have stayed in multiple condos over the years in Crested Butte, and this lovely place was perfect for our family of 4. It would also fit comfortably 1 more sibling with two sharing the large bed in the 2nd room. Wonderfully stocked with all the kitchen tools and appliances we could need, we were able to easily cook the dinners each night except for our traditional stop at Slogars. The fact that it was two HOUSE walk to having the shuttle pick us up was an added benefit. Hats off to the informal stop at 5th street. Even without that stop, it is only a few blocks to the official stop. Thanks for a great stay, Look forward to future visits - maybe in the summer next time! We (two adult couples) stayed here for four nights to ski Mt CB and check out the town. It was in a great location with easy access to the local bus unofficial stop three houses down at the stop sign. Easy walking access (2.5 blocks) to the main downtown and about three to a nice size market. The house was well equipped. Lisa, our POC was responsive. The only issue we had was due to the amount of snow this year; we had to do more shoveling than we would have liked to get our cars out of the driveway. But Lisa was on it and a plow was there within a couple of hours. We should have that much snow every ski season :-) All in all the house was great, Lisa was wonderful and a great place to stay. We plan to return later in the year for a fall stay. The house was nice and cozy just as advertised. Lisa did a good job in up front communications prior to our arrival. Well managed, cozy, well equipped, everything works, conveniently situated, quiet. This property is well managed. Everything we needed to know was spelled out clearly. The use policies are well thought out and make each person's stay more enjoyable. Everything works well in the house, from the radiant heating to the plumbing. The beds were comfortable. The house is cozy and very pleasant. Everything we needed to cook was readily available and well organized. The house is conveniently located within easy walking distance of a coffee shop, grocery stores and the entire downtown area, replete with shopping and restaurants. We had an extremely pleasant stay and will stay in this home again.